Jon, who took home a bronze medal last year, said: "I'm trying to push myself and see what I can achieve and that all seems a little bit easier when I've got Jester with me. Ex-Royal Marine Jon Flint fell 30ft while abseiling during a training exercise in 1996. It left him with a fracture in his lower spine, but because he was so fit it went undiagnosed until he left the services. After quitting the Marines his condition got worse until he was unable to walk unaided. That's when threeyear-old labrador Jester stepped into offer him a lifeline. Jon, a former lance corporal who served in Afghanistan and Iraq, said: "It's difficult to put into words how much difference he's made to my life and the life of my family. "When I was in the Royal Marines I knew the guys with me always had my back. And now I know Jester has always got my back." For three years, assistance dog Jester - featured on ITV's Britain's Favourite Dogs on Tuesday - has helped with taking out laundry, opening doors, answering the phone and picking up Jon's stick. Jon added: "He's always with me wherever I go and he enjoys what he does for a living because he's a working dog. "He's trained to enjoy it. He makes the things that I struggle with a lot easier." 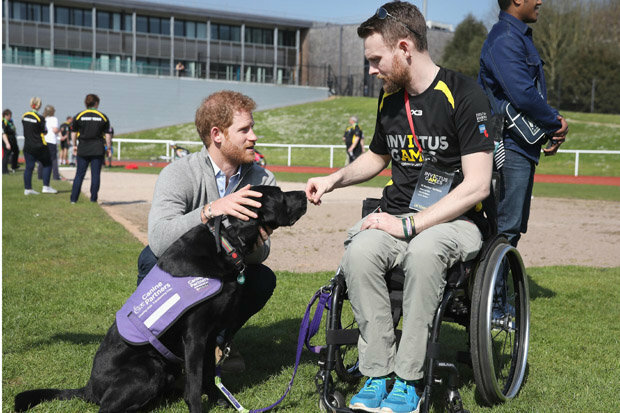 Thanks to vital help from Jester, Jon was able to join Britain's archery squad for the Invictus Games. And while competing he became pals with its founder Prince Harry.